Milkshakes sit in the sun at Houlton Farms Dairy Bar. 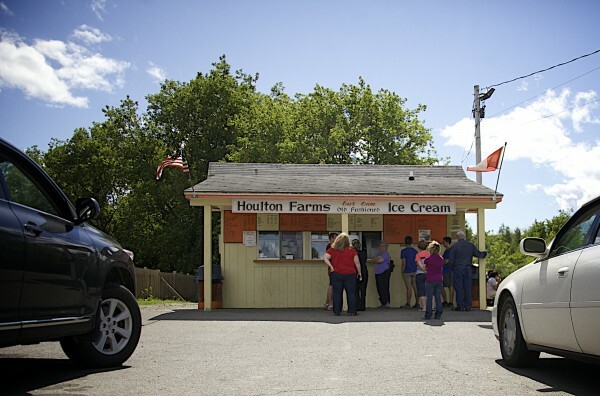 Houlton Farms Dairy Bar is a seasonal ice cream destination, one of six drive-in style burger and shake joints recommended by Bangor Daily News readers and being featured in the Living section this year. Tricia Welsch, a Bowdoin professor, waits for her ice cream at Houlton Farms Dairy. Welsch recently brought a group of new students to the diary bar after a day of volunteering. 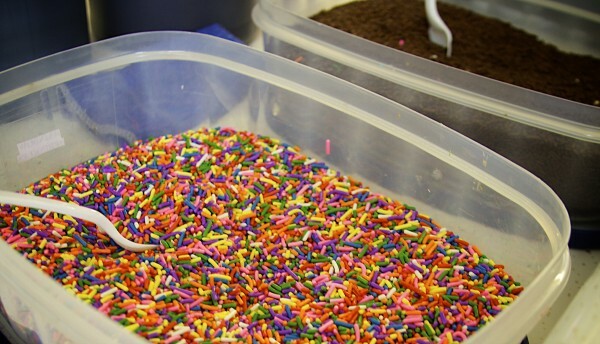 Sprinkles sit on a counter at Houlton Farms Dairy Bar in Houlton. 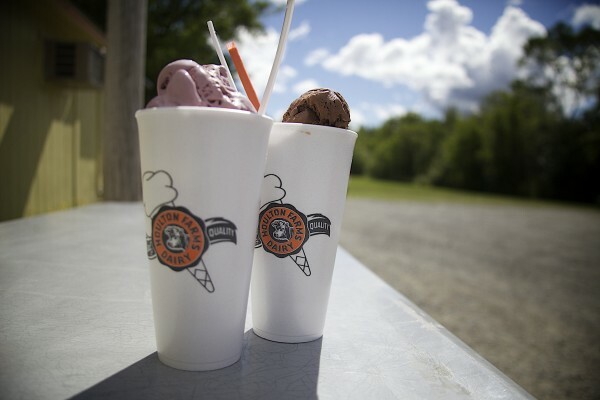 The ice cream bar is one of six drive-in style burger and shake joints recommended by Bangor Daily News readers and being featured in the Living section this year. Stamps hang on a board at Houlton Farms Dairy. 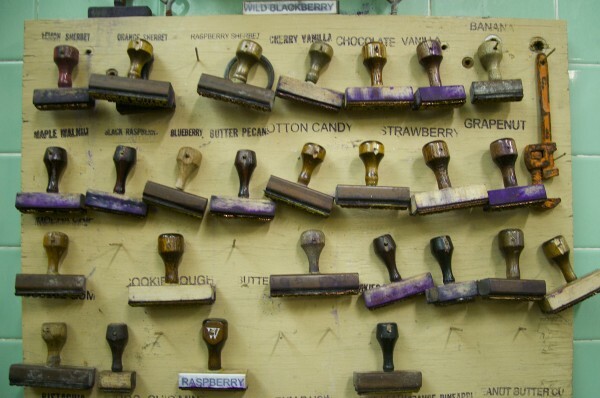 The stamps are used to mark the many gallons of ice cream the dairy production company produces every day. This is the second in a series of six stories featuring Maine burger and milkshake destinations — Burger Boy in Caribou, Houlton Farms Dairy, Owl’s Head General Store, L&H Burgers in Rockland and Fat Boys in Brunswick. The diners featured were culled from a list of recommendations from Bangor Daily News readers and staff. Please note, these features are just a sampling of the most recommended destinations and are not intended to endorse those on the list or discount any not included. HOULTON, Maine — The dozen or so customers standing in line recently at Houlton Farms Dairy Bar hailed from as close as just up the road and as far south as New Jersey and beyond. And they all shared one thing: A love for icy, creamy, so thick-you-need-a-spoon milkshakes, bursting with chunks of local fruit, nuts or candy mix-ins. For some, ordering from the smiling employees at the yellow and orange snack shack was a first. For others, it was tradition. For Elizabeth Roach, it’s a reminder of childhood and family. Started in 1938, Houlton Farms Dairy, now a mid-scale milk production company, is a lesson in what family, hard work and quality can mean for a business. Owned and operated by the Lincoln family — Alice, her husband Leonard, their two sons Jim and Eric, and Jim’s wife, Mary — Houlton Farms Dairy prides itself on providing quality with a touch of nostalgia to its loyal customers, many of whom say it’s the best ice cream in the country. Houlton Farms Dairy was started by Alan Clark, who originally delivered milk to homes, schools and businesses throughout The County. It was the first pasteurizing plant north of Bangor. As years went by, the dairy switched hands and continued changing with the times. Milk went from being stored in glass bottles to plastic jugs and cardboard containers. Delivery went from many trucks going to countless homes to a few going to grocery stores. The three dairy bars, now operating seasonally in Houlton, Caribou and Presque Isle, opened in 1983. They feature 28 soft serve flavors, 25 hard flavors and three sherbet flavors. And now, there’s even a Facebook page so true blue fans like Roach can visit virtually if they aren’t able to make it in person. “I’ll watch to see when they open for the year or what flavors are being featured,” she said. In the summer, July is often the dairy’s biggest month. 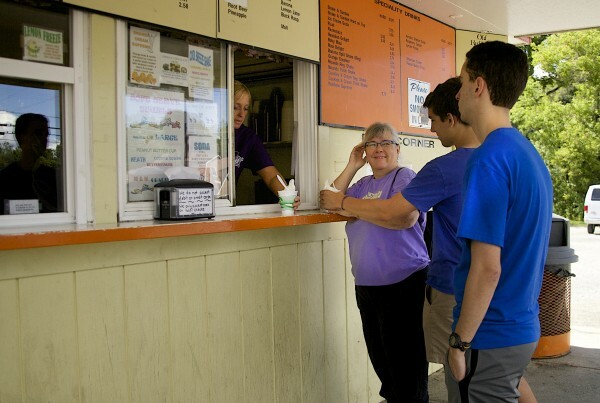 Events like the town’s Fourth of July festival, local road races and students home from college mean staff are pumping out more milk and ice cream every day, though the plant operates all year and the dairy bars are open all summer. The Lincolns are proud of their family ties. They are quick to point out that while they have official titles, they’re more of a formality. “We all do whatever has to be done. I don’t think we’d be nearly as successful if it wasn’t a family business,” Alice Lincoln said, explaining that their familial ties create an obligatory feeling that may not exist if they were just co-workers. Alice Lincoln started working at the dairy more than 45 years ago and her children and grandchildren have followed in her footsteps, along with about 50 other seasonal and year-round employees. Mary Lincoln manages the dairy bars, Eric and Jim drive trucks and are in charge of quality control. The company has also seen its fair share of mother-daughter employee sets from outside of the Lincoln family. Competing as a small company against big producers like Maine dairy powerhouses Oakhurst and Garelick can be daunting. But, Eric Lincoln said, the family takes it in stride, adapting as necessary. “It’s a bit like swimming with sharks … it’s a lot of work … [and] it’s definitely not a 7-5,” he said. The production plant sits at the end of a quiet residential street in downtown Houlton and smells faintly of sweet, warm milk. Inside, shiny metal pipes and giant vats fill long rooms, and gallons of flavors, empty cartons and bags of thick soft serve ice cream mix are stacked floor to ceiling. Ice cream, milk, sour cream, buttermilk and cream is shipped to stores and schools within a 60-mile radius, and butter is sent both locally and out of state. Houlton Farms Dairy is also known for one non-dairy product — lemonade. And while Alice and Mary Lincoln said they weren’t sure why the former owners started making the tart drink, they don’t plan on changing it any time soon. The company doesn’t ship to private customers, but it does sometimes receive special requests for the lemonade and ice cream to serve at weddings or other events. Local children drink the dairy’s white and chocolate milk with lunch and the most loyal of fans will buy gallons of lemonade and freeze it for the winter. “We had a wedding down south, the [groom] wanted his friends to have the ice cream he grew up loving,” Mary Lincoln said. The butter in particular often makes it as far as Florida or California in the luggage of snowbirds, according to Mary Lincoln. Alice Lincoln believes the craze has a lot to do with the emphasis the company puts on excellence. “We don’t buy for price, we buy for quality,” she said. They also search for and use local ingredients as much as possible — Maine blueberries, Aroostook raspberries and strawberries are mixed into gallon after gallon throughout the height of summer. Other icy hits include the lemon sherbet made with the famous lemonade, Grape-Nuts, cotton candy and bubble gum. “We heard it was the best ice cream in the country,” said Garreth Helm, a freshman who recently moved to Maine from New Jersey. Zach Deperry, a southern Maine resident, said he too had heard about the ice cream, but had never found himself far north enough in the state to give it a try himself. “It’s kind of one of those things you just have to do,” he said. Afterwards, the group dug into their milkshakes and bowls of ice cream, partaking in not only the delicious treats, but what some may have considered a right of passage. Location: The dairy has three dairy bars located in Houlton (Military Street), Presque Isle (830 Main St.), and Caribou (98 Bennett Drive). The main dairy processing plant is located at 25 Commonwealth Ave. in Houlton and customers can purchase products there, though it is not generally open for tours. Family-friendly features: The dairy bar in Houlton offers plenty of shaded picnic tables, lots of parking and a large grassy field for kids to play. Payment method: Houlton Farms Dairy bars accept cash only. Famous for: The “Awful Awful,” a milkshake with an extra scoop of ice cream in the middle. Prices: Ice cream and milkshakes range from about $2 to $5.